Those are awesome! I just found that tutorial yesterday! I should have waited! I love the Blue dogs! Those burp cloths are great! You did a good job on them. 🙂 I’m sure that the new mom will appreciate them a lot. LOVE your fabrics! I’ll have to use the gerber diapers next time. The cotton diapers I used were way too thick for this project. Yours turned out great! I love these. This is a fabulous baby shower gift. gorgeous! thanks for the link, these are being added to my project list, for sure. 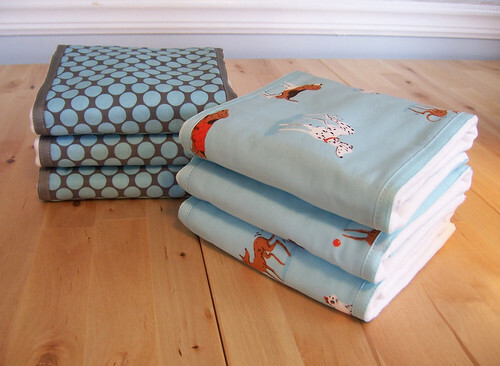 Wonderful, cheerful baby burb cloths. Thanks for the tutorial! Nice! I love the idea of adding a handmade element to items off a registry. Personalized and yet a needed/requested item. What a bonus! those are super cute! I’m going to have to try those for my friend’s new baby! I’m glad you like my tutorial. 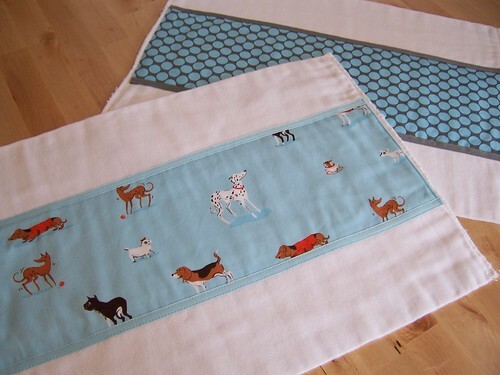 I’ve been making these burp cloths for several years now and the new mom always appreciates them. I’m actually thinking about switching to the Gerber flat fold diapers. It seems the diapers I’ve bought lately have become a lot thicker in the middle and it makes them a little too bulky. Yours are adorable!